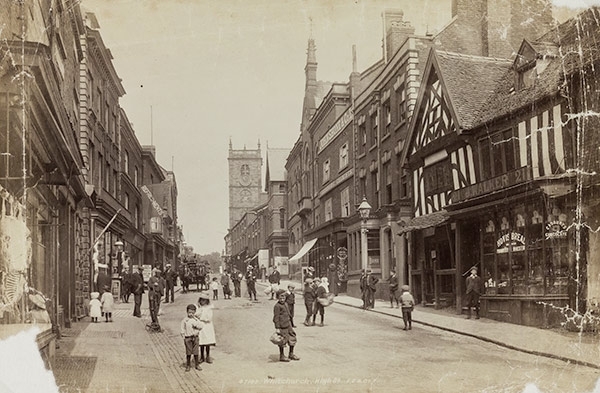 Saturday 12th October sees Whitchurch History Day, a day to celebrate all things relating to Shropshire’s oldest town. If you’re connected to Whitchurch in any way you’re going to love it! There’ll be talks, presentations, live music, walks, historic walks and tours. This is a unique opportunity to discover so much about the town and its hinterland and to share your memories and local knowledge. James Gosling will be giving a talk on the life and work of Revd William Egerton, Rector of St Alkmund’s 1846-1908. Peter Brown will be talking about the canal’s towns and Dr Judith Hoyle about the work of the Whitchurch Heritage Centre. Members of the band Jigsmith will be on hand to entertain everyone and there will be a historic tour of Whitchurch and of the parish church too! For those less energetic there’ll be some film too. There’ll even be military re-enactments! Jointly presented by the Friends of Shropshire Archives and by the Heritage Lottery funded project Volunteering for Shropshire’s Heritage the event will take place at Brownlow Community Centre, Claypit Street, Whitchurch SY13 1LF. Shropshire Council’s Archives and Libraries services, along with Whitchurch Heritage Centre will all be represented at the event. This promises to be a memorable day for the town and for all who care about its history and heritage. Tickets for the day which starts at 10.30am (refreshments available from 10am) are available from Pat Kiernan, 11 Lime Tree Way, Wellington, Telford TF1 3PJ or contact John Benson (john.benson@shropshire.gov.uk/ 01743 255377). Tickets cost £10 (or £5 for members of the Friends of Shropshire Archives, Whitchurch History and Archaeology Group and Whitchurch Heritage Centre volunteers). We’d love to see you in Whitchurch on the 12th October.